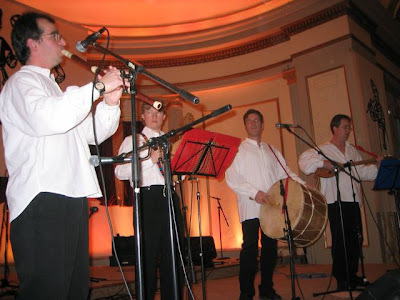 This Sunday, March 9, 2008, Veseliyka will be playing at Madison Folkdance Unlimited's Bulgarian Night. Veseliyka plays traditional, village-style music from the Balkans. It consists of Dave Kantor: gaida and kaval; Yulian Yordanov: tupan and vocals; Flora van Wormer: gadulka; and me: tambura. Open to the general public and admission is free, although donations are appreciated. The event will be held in the basement of The Crossing Campus Christian Center, 1127 University Avenue, Madison, WI. For more information, contact Kim at kimcaisseATgmailDOTcom or Michael at mkATmailbagDOTcom. The question is: how DO you say "eggamuffin" in Bulgarian? I'll have to do some research on that.